We shipped out these lovely invitations last week, but just now have the time to share them with you! 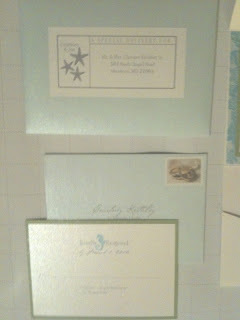 Courtney started by picking out the Starfish and Seahorse invitation. 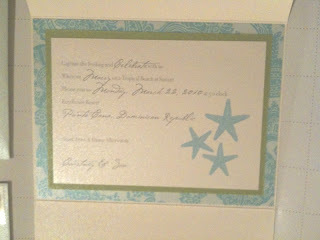 She wanted a very laid back invitation, so we changed the fonts to reflect her oceanfront wedding. 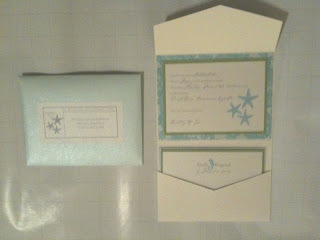 We also reduced the size of her pocketfold to a 4x6 since she only needed to include an rsvp card. ___ Yes! Save ___ beach chairs for us! ___ No! We hate to fly! 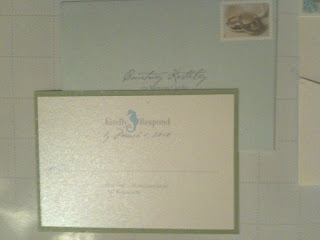 I thought that the wedding stamps available thru the usps looked perfect on her rsvp envelopes. 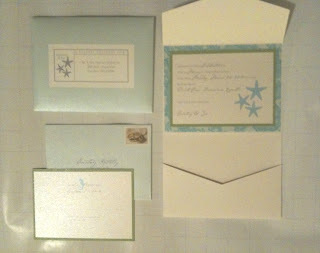 We finished up by creating custom labels for the outer envelopes that included her guests' addresses. This can really save time in the end instead of hand addressing each envelope. They looked great too, because they aren't your plain old Avery labels from the office store. These are actually the same shimmery White Micah stock used for her invitation that was run through a sticker machine to make a label. They create a really stunning effect. These are very pretty - I love the design and colors! !